I grew up not eating winter squashes, not because I did not like them, but because nobody ever put a dish with zucca (winter squash or pumpkin) of any kind on my plate. When, as an adult, I realized what I had been missing, I resolved to devote the rest of my life to making up for the years of deprivation. I don't recall encountering a winter squash I disliked, and I am never intimidated by the look of a previously unknown one. Rather, I am tempted to carry it home for a game of cook-and-taste. I have a favorite recipe for turning winter squash (usually, though not always, butternut squash) into dinner, a recipe from Vegetarian Cooking for Everyone. My partiality for the recipe is something I share with the cookbook's author, Deborah Madison. She prefaces the recipe with these words: "This is one of my favorite cold-weather dishes. 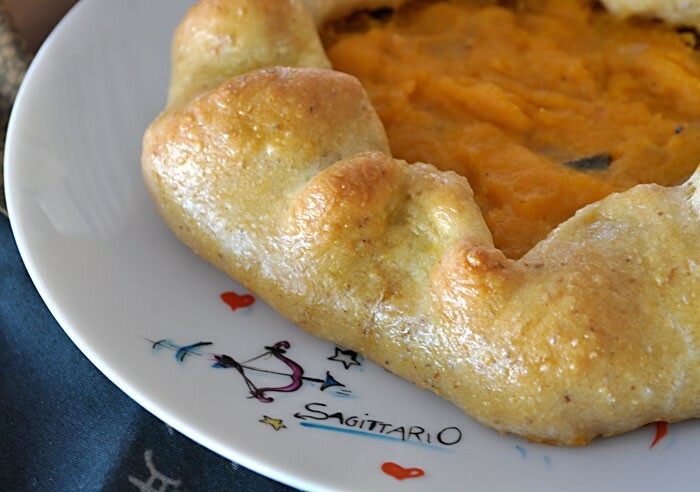 The cheese and sweet squash make an intriguing combination, and a yeasted dough is particularly good here." In going over the recipe again some time ago, I asked myself: does Deborah Madison really remember? I mean, Vegetarian Cooking for Everyone, first published in 1997, contains 1,400 recipes, and after that she has published many other cookbooks. I decided there would be no harm in asking, so I did. I learned that the recipe for Winter Squash Galette has a firm place in her memory: It was and still is one of her favorites. During our conversation, besides satisfying my curiosity, she graciously gave me permission to reprint the original recipe and that of the yeasted dough required. When, a year and a half ago, I learned that I would meet Deborah Madison in person, I considered bringing my copy of Vegetarian Cooking for Everyone with me to show her the unmistakable signs of repeated use in the field (well, the kitchen), in the form of worn-out edges, a detached page and spots of food, like that of butternut squash on the page with the recipe for Yeasted Tart Dough with Olive Oil, used as base layer for the Winter Squash Galette. I decided to keep my enthusiasm under control but later regretted my decision, as she confirmed to me that she is always glad to see a well-used specimen of one of her cookbooks. In the chapter dedicated to savory tarts, pies, turnovers, and pizzas, Vegetarian Cooking for Everyone has a section on savory vegetable galettes. Inspired by fruit galettes, Madison developed a set of recipes for galettes with savory fillings, like winter squash. As described in a previous Table Talk column ("A is for Apple," Oct. 29, 2009), a characteristic of galettes that makes them appealing to my challenged food styling capabilities is their free form: The dough does not need to fit in a pan, so an asymmetrical galette does not create a logistical headache. Madison explained that the filling for Winter Squash Galette was inspired by squash ravioli. Fresh pasta filled with zucca is a tradition of an area of northern Italy: The name and shape of the pasta, the ingredients of the filling (besides the protagonist vegetable) and the accompanying sauce depend on the locality. For example, when my husband and I visited Mantova, for lunch he had a plate of the renowned local tortelli di zucca, served with melted butter and grana padano cheese. The filling of that version of stuffed pasta showcases the local squash, called zucca mantovana, and mostarda mantovana, a traditional preserve of apples flavored with mustard essence, and it includes also amaretti (almond macaroons) and grana padano (or parmigiano reggiano) cheese. Back to the Winter Squash Galette: It is a dish that, in Madison's own words, "makes a great vegetarian entrée. Vegetarian entrées are not the easiest dishes to come up with -- they need to have eye appeal, focus, good texture, interest (and of course, they need to taste good!) and this galette (any savory galette, actually) accomplishes this. I adore sage with squash, and garlic (and brown butter and Gorgonzola or fontina...)"
I prepare the squash part in advance, so it is at room temperature when the galette is assembled. One departure I take from the original Winter Squash Galette recipe is the use of one of the hard cheeses from my home production, each cheese imparting an individual touch to the rendition of the dish. Until recently, I had always made a large galette. Then, one day, I tried making six small galettes instead -- an option offered by Deborah Madison in the introduction to the section on savory vegetable galettes. I made sure the dough and the squash filling were divided into six equal parts. After the suggested resting period (see recipe for the dough), I rolled each ball of dough into a disk seven inches across, which, once the one-inch border was folded over, resulted in a five-inch mini-galette, which, once baked, made a perfect individual portion. As Madison notes, the trick is to roll the dough very thin: "If you don't, your crust will end up bready." Cut the squash in half, scrape out the seeds, and brush the cut surface with oil. Stuff the garlic into the cavities and place the squash cut side down on a sheet pan. Bake until the flesh is tender, about 40 minutes. Scoop out the squash and squeeze the garlic cloves. Mash them together with a fork until fairly smooth, leaving some texture. Warm 1 tablespoon oil in a skillet over medium heat. Add the onion and sage and cook until the onion is soft and beginning to color, about 12 minutes. Add it to the squash along with the grated cheese and season with salt and pepper to taste. Roll out the dough into a 14-inch circle and spread the filling over it, leaving a border of 2 inches or more. Pleat the dough over the filling, then brush the edges with beaten egg. Dissolve the yeast and sugar in the water in a medium bowl and let stand until bubbly, about 10 minutes. Add the oil, egg, and salt, then stir in the flour. When the dough is too stiff to work with a spoon, turn it onto the counter and knead until smooth and elastic, about 4 minutes. Set the dough in an oiled bowl, turn it over to coat, cover with a towel, and let rise until doubled in bulk, 45 minutes to an hour. Roll it into a thin circle and use it to line a tart or pie pan or to make a free-form galette.